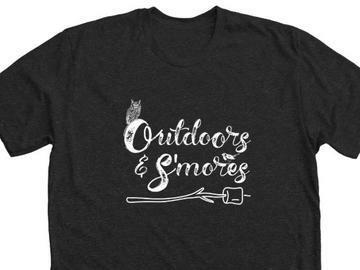 Outdoors & S'mores Shirt - Support Dogwood Canyon! Edit 1/11/19: Online shirt sales have been stopped due to the order deadline of January 10. We will have a limited amount of additional shirts available in the gift shop at the price of $22.99 + tax. Shop early to get your size. All proceeds directly benefit Dogwood Canyon! New this year! We are offering shirts as souvenirs for our most popular event. Our Outdoors & S'mores shirt features an owl and a bird on the front with the Dogwood Canyon Audubon Center logo on the back of the shirt. Shirts are available in charcoal with white images and come in both adult and children's sizes. By placing your shirt order on Ticketleap by January 10, you save $3.00 per shirt compared to our gift shop price and you guarantee that we will have your size waiting for you to pick up during the Stars & S'mores event on January 19. You will also receive a coupon for $5 off a purchase of $30 or more in our gift shop the night of the event. Shirt orders directly support Dogwood Canyon Audubon Center. As a free-admission facility, we rely on sales of merchandise and donations to meet budgetary needs. Please also visit our gift shop. If you would like to order a shirt without attending the event on January 19 and would like to pick up at a later date or have an order shipped, please e-mail dcac@audubon.org to make arrangements.